We know Major League Soccer wants to shove rivalries down our throats, and for good reason too as they are a big money maker for them and the clubs involved. The Houston Dynamo and FC Dallas are starting to turn up the heat on their Texas rivalry here this year, ahead of their first meeting later this month. 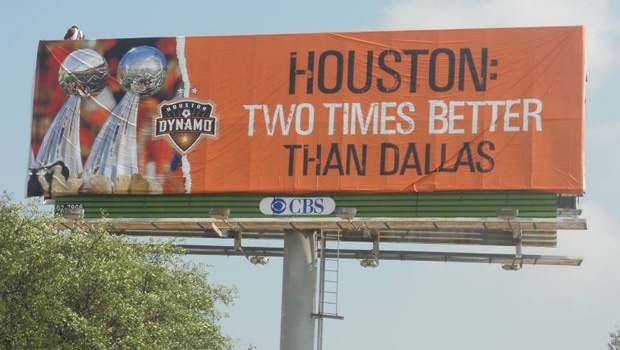 The Dynamo have hyped up a billboard that they would put here in Dallas for a couple weeks. When that got out someone flew a plane overhead Robertson Stadium during a national TV game for the Dynamo the next day with a banner that said “Dallas Til I Die”. Now that Dynamo billboard is live and in person here in Dallas. I have to say it is the little things like this that will get the casual fan involved more. Dallas sports fans don’t like Houston sports fans and vice versa. Its a regional thing just like you have with Portland-Seattle-Vancouver and the East coast teams. Things like this are good for the rivalry as it sparks interest that may not be there before from people. What will Dallas do in return? I’ll try to find out tonight when they take on Toronto FC. No doubt they have something in the cooker. We didn’t have to play the NEW ENGLAND REVOLUTION, for crying out loud, in our final! Yes but you played the CRapids of all teams. When’s the last time you checked, 1996? Dallas has a trophy, they won the 1997 Open Cup. Perhaps not a prestigious trophy but some silverware nonetheless. 15 seconds on Google could have told you that. I love the billboard! And I think its great that they are making this season so interesting with all the rivalry!